Home How Was The Show? All Them Witches Cast A Spell In St. Louis. Nashville’s All Them Witches Cast A Musical Spell and Made it Witchy At Blueberry Hill. The assembled crowd of witches and warlocks represented a cross-section of music fans—fresh-scrubbed young women and dudes, as well as more seasoned fans with mortgages and kids, congregated in the dark, hot confines of the Duck Room at Blueberry Hill last Saturday night. For the uninitiated, All Them Witches’ music is a blend of 60’s psychedelia, Haight Asbury free-form jams, mind-bending, polyrhythmic math rock, Southern-fried blues slide guitar, and soaring leads. In many ways, they are four bands in one, and that suits their cultish, devotees just fine. The Witches took the nearly pitch-black stage to the strains of Pink Floyd’s “Astronomy Domine,” the 1967 opus from the genius and troubled mind of Floyd founder, Syd Barrett. They were met with screams, loud applause, whistles, and even some headbanging. Charles Michael Parks, Jr, the bands handsome “front man,” vocalist, and bassist was the subject of Beatles-level female adulation from a front row of young, pretty things that had traveled from far away to witness their triumphant return. The band hasn’t played St. Louis since a legendary show at the Firebird all the way back in April 2017. I overheard fans talking about their other shows at the defunct Demo and even way back at LouFest 2015. The lads, now a trio, seemed to have lost nothing from the recent departure of keyboardist Jonathan Draper. If anything, their sound was more laser-focused and tight. The hour and a half+ show featured near darkness, circular drumming, tempo shifts, heady, hypnotic excursions, and bombastic guitar flourishes ala Jimmy Page, jazzy, Jerry Garcia runs and slide work that would make Duane Allman proud. Their St. Louis show was the final show of their North American tour and frontman Parks addressed the St. Louis crowd throughout the evening’s festivities and heaped praise on the devoted fans. At times it was hard to understand what he was saying, but, hey, the little girls understand. The SRO crowd was treated to tracks from All Them Witches’ growing catalog (five studio albums) including the pulverizing, distorted overdrive opener, “Funeral for a Great Drunken Bird” and latest slab from their latest self-titled release, including the mesmerizing, hypnotic, track “Diamond.” Like fellow retro rockers, The Black Angels, All Them Witches mine the deep, dark, psychedelic vein of the Velvet Underground and Syd Barrett-era Pink Floyd. 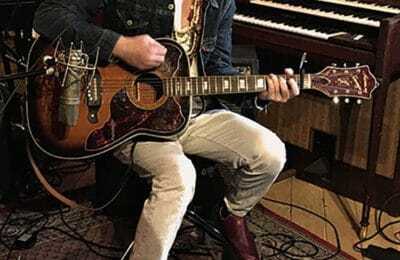 The enthralling spell exploded into Toolish tones courtesy of guitarist Ben McLeod. Other stand out numbers included the whacked-out fuzz and garage jam goodness of “Fishbelly 86 Jams,” a tune that sounds like it could be forgotten track from Blue Cheer or the MC5. As with many of All Them Witches tracks, this song features strange time shifts, drummer Robby Staebler’s syncopated, circular beats, great fuzzy guitar stabs, and Park’s unique bark and vocal delivery. The crowd went ape when Parker shouted the song’s countdown mid-song: “1,2,3,4,5,6,7,8,9,10,11,12,13,14,15,16,17,18,19,20!” Somehow, it all makes sense when Parker delivers it in a southern, speaking in tongues, preacher fashion. In the hands of a lesser band and vocalist, it would just be gibberish. All Them Witches powered through an eleven-song set and a couple of encores. The capacity audience definitely got their money’s worth and then some. All Them Witches cast a spell and left the St. Louis audience with an experience to tell the grandkids about. Buffalo’s power trio, Handsome Jack, warmed up the crowd and were enthusiastically received. Their three-part harmonies, crunchy riffs, and drum solo were a hit with the capacity crowd. Imagine the best parts of Humble Pie, Cream, and the Faces mixed with CCR, Mountain and Blue Cheer. Their new CD, Everything’s Going To Be Alright,” is out on Alive Natural Sound Records. 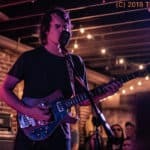 All Them Witches and Handsome Jack appeared at Blueberry Hill’s Duck Room on Saturday, November 24th, 2018. Previous PostSeptember Mourning: It Comes From The Dirt. Fertile Minds Make Dark Art. 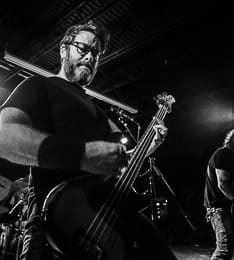 Next PostA Show To Sink Your Teeth Into: Red Fang @ the Firebird.